WHERE PUNA DE ATACAMA IS LOCATED? The Puna de Atacama is an high altitude plateau located in Argentina and occupies the northwestern desert among the mountains west of Salta, Cafayate and Purmamarca, up to the border with Chile and Bolivia. The plateau has an average altitude of 3500 meters, among Andean peaks that frequently exceed 6000 meters of elevation. Because of the very low precipitations, the Puna de Atacama is considered a high mountain desert and the area is very remote, almost completely uninhabited, not yet targeted by mass tourism (not like the nearby plateau of Chile and Bolivia). From a geological point of view, the Puna seems a great melting pot where everything is evolving and where a wide variety of minerals, showing infinite colors, have been brought to the surface of the earth by the countless volcanoes present throughout the region, and by tectonic thrust provided by the Pacific plate. WHY GO TO NORTHERN ARGENTINA? The Puna has geological and scenic features that make it one of the last paradises in the world, yet to be discovered, a perfect place for photography enthusiasts, geologists, botanists and anyone who loves extreme landscapes. The harshness of the climate without tall vegetation, joint to the almost total absence of snow, shows bare rocks with a turbulent history that tells how the south American continent was born, while large salt pans, colorful lagoons and minerals with psychedelic colors, create a unique landscape among the most beautiful of the world. But even if the Puna is a harsh desert, just look closely at the ground to discover an endless variety of miniature plants that have evolved to cope with such difficult conditions, while vicuñas, llamas, ostriches and flamingos wander among places that seem impossible for the life. HOW TO GET TO PUNA DE ATACAMA? Since Puna de Atacama is a very remote region with a definitely hostile environment, you might be wondering how to get there. As already said, Puna de Atacama is located in northwest of Argentina, where there are several provinces served by regular flights onto Buenos Aires. Probably, the most convenient base for getting to Puna, is Salta, well connected to Buenos Aires by different airlines: if traveling to Argentina from overseas, you will probably arrive in Buenos Aires EZE airport, while most internal flights in Argentina operates onto Buenos Aires AEP airport (the driving time between the two airports is usually around one hour, depending on traffic). Just make sure that the time between the flights allow such long transfer time, or simply plan a night in Buenos Aires to have a rest and additional buffer in case of delays. From Salta, you can get to Puna in 2-3 full days by car and driver: a time that will let you either to enjoy the beautiful things that are along the road, either to acclimatize to high altitude (an essential step to prevent mountain sickness). Getting from Salta to Puna in only one day, although possible, it is definitely not recommended, as you will miss lot of interesting attractions of Northern Argentina along the way, and you will also risk mountain sickness. Getting to Puna de Atacama is also possible from Chile or Bolivia, although the trip can be longer and more expensive. HOW TO MOVE AROUND AND WHERE TO SLEEP IN THE PUNA DE ATACAMA? A tour to Puna de Atacama is not regular travel, but a real expedition in a very remote region, with little possibilities for rescue operations, bad conditions of roads and tracks, and an harsh environment with potentially lethal weather. All these conditions suggests to strictly avoid any kind of independent travel throughout Puna de Atacama, unless you are already very expert about how to deal with a similar environment. In most cases, hiring a driver with a suitable 4x4 vehicle or joining a group with a local guide, is the best bet: there aren't many tour operators offering trips to Puna de Atacama, but Socompa, based in Salta, has lot of itineraries and offers group departures as well as private trips. Any trip to Puna de Atacama requires several days and you may wonder where to sleep in such remote location: usually the itineraries are optimized to overnight in one of the few villages along the way, some offering quite good accommodations (indeed very good, considering where they are built) with soft beds, real inside toilets, hot water and most amenities. However, if you are going to trek far away, the only choice is to bring a tent together with all the equipment. WHAT IS THE BEST TIME TO GO TO PUNA DE ATACAMA? Since a tour to northern Argentina needs lot of time outside to enjoy nature and landscape, you may be wondering what is the best season to visit Puna and the attractions all around, ensuring better weather and more pleasant conditions. First of all, you should know that the Puna de Atacama is a high altitude desert and, as such, it receives no more than 50-150millimeters of precipitation every year, corresponding to about 1/10 of average rainfall in southern Europe. Such precipitation is concentrated mainly from November to March, but in any case, even during wettest months, the rain is so scarce, that it doesn't risk to ruin trips: as counterpart, the temperature is much more pleasant (as it's summertime), the wildlife is at its best and it's usually possible to visit Mina Julia, as the track doesn't have snow. During southern winter instead, roughly from May to September, precipitation is reduced to minimum and the sky is usually clearer with fewer clouds, however, strong wind is quite common and with this, lot of dust. Early in the morning, temperatures may fall well below freezing point, while the ice may block the track to Mina Julia at 5200 meters. Putting the things all together, we may say that the best time to visit Puna de Atacama is probably the transition season during April or October, usually showing the benefits of both summer and winter. These months are also good to visit the beautiful regions downhill around Salta (which are indeed to rainy during austral summer). HOW TO PREVENT MOUNTAIN SICKNESS? 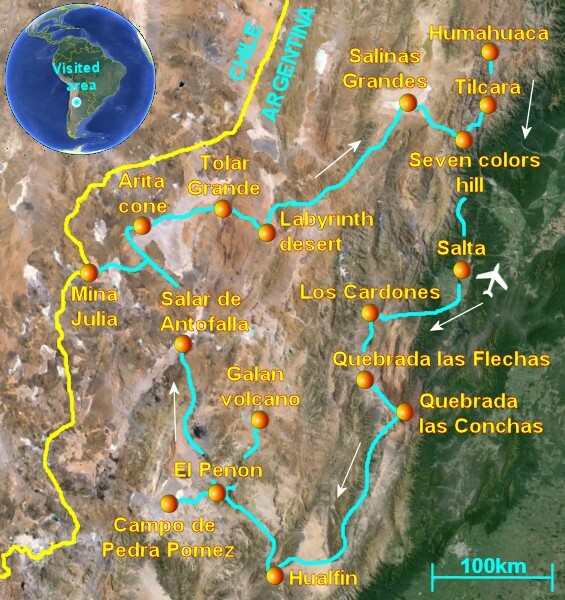 Before getting to Puna, spend 3-4 days downhill among Salta, Los Cardones, Catchi and Cafayate. Not only these places are very beautiful, but their middle altitude will help a lot acclimatizing your body gradually to reduced oxygen. Common mountain sickness symptoms are light headache, slow digestion and some insomnia, all conditions that disappear in 1-2 days. However, if these symptoms become worse, with vomiting or vertigoes, it is best to return to lower altitudes and seek a doctor advice as soon as possible. Where to stay in the Puna? Although the Puna is largely uninhabited, there are a few small villages where, thanks to a moderately growing tourism, small hostels or guest-houses are available. The standard of these structures is usually below the average. In the main villages of El Penon and Tolar Grande, there are instead real hotels (respectively, Hosteria el Penon and Casa Andina) with private rooms, hot water, electricity and most of the standard amenities. If you are planning an expedition among the most remote places of the Puna, perhaps trekking or climbing a summits, the only choice is to bring a tent together with all the equipment. Where to eat? How is the food? Some of the facilities that provide hospitality, usually offer meals also. In any case, most of the villages, have small restaurant open for breakfast, lunch or dinner. Considering the remoteness and the environment, the food is incredibly good and include local specialties, like different types of Andean potatoes and lama steak (just remember to not eat too much, as the altitude makes the digestion slower). During day excursions to remote places, the only option is to carry a lunch box. Is it true that coca leaves may help with mountain sickness? It is not scientifically proven that the consumption of coca leaves, not to be confused in any way with the direct intake of cocaine, can alleviate the symptoms of mountain sickness, but many people who use it report to find benefits if consumed as infusion (like a tea) or chewed and held in contact with the inner side of the cheek. How to dress in the Puna? How is the temperature?The temperatures in the Puna are characterized by a strong day and night excursions, with the difference between the maximum and minimum temperature that can exceed 30 degrees Celsius. This suggests to better dress in layers, regardless of the season, not forgetting an outer layer working as wind-stopper and a good hat covering the ears. During the winter, at higher elevations, the temperature may drop below to -15/-20 Celsius at dawn, but as soon as the sun rises, the air warms up rather quickly above the freezing point. In the summer, the temperature rarely touches the freezing point at night, while during a sunny day, it can be quite warm if not hot! Considering that part of the trip takes place downhill, at relatively low altitudes, it is good to be equipped to handle both hot and cold, regardless of the season. Very important is a good pair of sunglasses (bringing another one as backup) and a high-protection sunscreen. Does the mobile phone work? Any chance for the Wifi? The mobile phone network is good and quite reliable downhill, instead, throughout the Puna de Atacama, the mobile phone will work only in the main towns. When booking a tour to Puna, it is best to choose an operator who provides a satellite phone or a localization device to be used in case of emergency (or, you may bring a your own Iridium phone). The Wifi is available for free in most hotels (surprisingly, even in the Puna) and in many restaurants. How to recharge batteries? In the case of a normal tourist circuit, with overnight stays in hotels, the batteries can be recharged every night without any problem. The voltage is 220, while the frequency is 50Hz. The power plugs are usually of type C (like southern Europe) or type I (like Australia) and is usually best to bring an adapter for both types. Salta is a must-stop for everyone who want to visit the northwest of Argentina and the Puna de Atacama. The city is very interesting for its colonial architecture, for the numerous churches and for the archaeological museum of high mountain (MAAM) housing also three Inca mummies of children. The journey from Salta to Puna de Atacama begins across Los Cardones National Park (the second cactus forest in the world for number of specimens), before visiting several rural villages such as Catchi and Molinos. The journey to Puna de Atacama is not a simple car transfer from point A to point B, but it's a great opportunity to experience the wonderful northwest of Argentina, made of canyons, colorful mountains and interesting archaeological sites. From the town of Hualfin, the road climbs towards the Andes and soon reaches the 3500 meters of altitude with the village of El Penon, which is the base for day trips to various attractions of this part of the Puna de Atacama. The first excursion is to Campo de Pedra Pomez, a chaotic labyrinth created by an ancient eruption and subsequent erosion of pumice stone. Day tour to the high-altitude lagoons, at 4500 meters of elevation, where thousands of pink flamingos can be admired (but only during the summer) in a landscape that seems to be extra-terrestrial. Other wildlife include vultures, foxes and ostriches. The journey from El Penon to Tolar Grande takes place in the heart of the Puna de Atacama, among breathtaking landscape that change constantly, alternating between immense salt flats, colorful mountains, ancient volcanic cones and high mountain passes above 4500 meters. Tolar Grande is another great base for further day trips in the region. Who has never dreamed to visit abandoned ghost towns? In the Puna de Atacama there are several abandoned villages, like Mina Casualidad and Mina Julia, left completely deserted after the business of sulfur mines has dropped. Mina Julia is located at 5200 meters, among sulfur and other minerals with psychedelic colors. From Tolar Grande, the journey continues leaving the Puna de Atacama behind, visiting first the curious Ojos de Mar, the spectacular rock formations of the Labyrinth Desert and the immense salt flats of Salinas Grandes, before getting to lower altitudes. Before going back to Salta, I finally visit the beautiful Argentine province of Jujuy, which offers traditional villages, more Inca ruins and spectacular landscape dominated by colorful mountains.